Johnson’s Nursery, one of the landscapers donating their efforts, begins work at 16 North Parade Ave., Buffalo. Professional landscapers are donating their time and materials to transform 19 front yards in Buffalo as part of the Front Yard Competition, the first event of its kind in the country. The event was kicked off with a press conference this morning. Work will continue until Saturday, July 10– then comes the best part! You get to vote for your favorite yard from July 11 to July 18. Physical ballots will be available outside each home along North Parade Ave. and online voting will take place. The web site will also feature a blog, where the public can track the progress of the gardens and read profiles of the landscapers and homeowners. 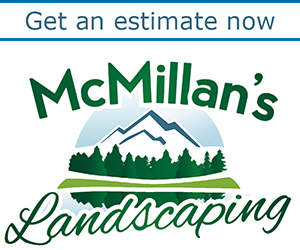 In future articles, Buffalo-NiagaraGardening.com will ask the landscapers to explain what the homeowner was looking for in the makeover, and what they did to accomplish their goals. The competition, which is part of the National Garden Festival in Buffalo, is taking place along North Parade Ave. between Fillmore Ave. and Northampton St. The street borders Martin Luther King Jr. Park, which was designed by famed architect Frederick Law Olmsted. The homes on North Parade Ave. were built between 1890 and 1920. Beyond the Basics Property Services, Inc.
Birch Grove Landscaping & Nursery, Inc. In addition to the public voting, a team of gardening experts will review the gardens and bestow awards in several technical categories to the landscapers. The Front Yard Garden Competition is being coordinated by the Buffalo Olmsted Parks Conservancy, the Western New York State Nursery & Landscape Association, the New York State Certified Nursery and Landscape Professionals, the Buffalo Niagara Convention & Visitors Bureau, and the National Buffalo Garden Festival organizing committee. 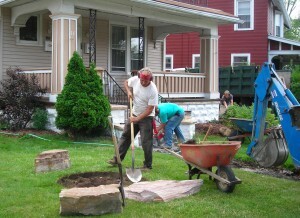 Reporters cover the press conference that opened the Front Yard Competition in Buffalo on July 6. The homes on this block were built around the turn of the last century. Efforts like this one try to bring the grandeur of that era back to the neighborhood, said Otis N. Glover, director of strategic initiatives for the Buffalo Olmsted Parks Conservancy. “This is going to make a lasting, legendary impact on our neighborhood,” said David Collins, treasurer of the MLK Society. Although this is the first year the event has ever been held, plans are already being made to hold a second annual Front Yard Competition next year. Glover said the event will be held on Best St., between Herman and Fillmore.